Sakura solid markers. 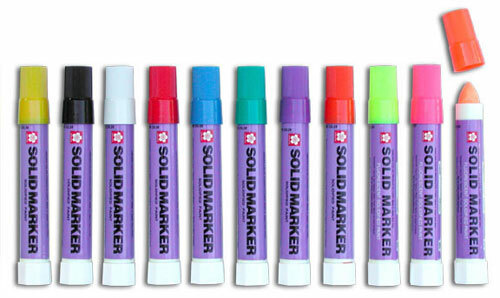 Permanent, waterproof markers which have a crayon look to them. These are also referred to as "streakers" due to a similar item called "Mean Streaks" made by Sanford. Sakura solid markers are just a little softer, don't smell as bad and come in many more colors. Imported from Japan. Now available in store.